RAMR - Volumen 18, NÃºmero 3 Pulmonary Lobectomy. What are the Benefits of Video-assisted Thoracoscopy? Pulmonary Lobectomy. What are the Benefits of Video-assisted Thoracoscopy? Introduction: Despite the increasing use of video-assisted thoracoscopic lobectomy, this surgical approach is still controversial in certain aspects. The purpose of this study is to compare the surgical results of video-assisted thoracoscopic pulmonary lobectomy to pulmonary lobectomy via thoracotomy. Materials and Methods: Between 2008 and 2017, 153 patients (n = 89 males) had surgery at the Hospital Universitario Fundación Favaloro. Results: 39/89 patients underwent video-assisted thoracoscopic lobectomy. Patients who had video-assisted thoracoscopy and were diagnosed with lung cancer mostly had stage I tumors (25/39 patients). Postoperative complications and mortality rates were similar in both groups. Video-assisted thoracoscopy patients had a significantly shorter pleural drainage time (4 vs. 3 days, p = 0.004) and a shorter length of hospital stay (6 vs. 4 days of stay, p = 0.03). The number of lymph node stations sampled during surgery was higher in the patients operated via thoracotomy (4 vs. 3.5 lymph node stations, p < 0.001). Conclusion: Video-assisted thoracoscopic lobectomy was at least equivalent to surgery by means of thoracotomy in terms of postoperative complications. The main benefits of the video-assisted thoracoscopy approach were shorter pleural drainage time and length of hospital stay. Special attention should be paid to nodal sampling when the surgery is performed via video-assisted thoracoscopy. Key words: Pulmonary lobectomy; Video-assisted thoracoscopic lobectomy; Postoperative complications. The first thoracoscopy was described more than 100 years ago by Jacobaeus in Sweden1. However, it was not until the ninety’s that the first series of video-assisted thoracoscopic lobectomies was published2. After this first series of 45 patients, the interest in performing video-assisted thoracoscopic lobectomies began to grow. The technique was improved and at present there are some reports of major pulmonary resections made by video-assisted thoracoscopy with only one access to the thorax, also called uniportal video-assisted thoracoscopy3. Many experts believe that the video-assisted thoracoscopic lobectomy is the technique of choice for the treatment of early-stage lung cancer4. Various authors show the advantages of the video-assisted thoracoscopic lobectomy in terms of less pain, less recovery time and fewer postoperative complications5. These benefits were shown in several retrospective, comparative studies6-9; however, at present, there is not a prospective study validating these conclusions. Our group has published in 2009 the initial experience with video-assisted thoracoscopic lobectomies10. The purpose of this study is to update our series and compare postsurgical results of video-assisted thoracoscopic lobectomies and lobectomies via thoracotomy. Using our Thoracic Surgery Service prospectively mantained database, we located patients with pulmonary lobectomies between 2008 and 2017. We identified 153 patients who received a pulmonary lobectomy and determined the corresponding registration code of each one of them according to the surgical access. Patients were organized in two groups: lobectomies via thoracotomy and video-assisted thoracoscopic lobectomies. We included all the patients older than 18 years old who received an elective lobectomy, and one patient was excluded with an urgent lobectomy due to hemoptisis. Apart from demographic, surgical and postsurgical data extracted from the records, we reviewed the clinical records of the patients, as well as the surgical and pathology reports. Surgical technique: the lobectomies via thoracotomy were performed with a posterolateral thoracotomy, with section of the latissimus dorsi muscle and preservation of the serratus. Typically, the posterior arch of the sixth rib was sectioned. The pulmonary resection was carried out in a standard way, sectioning each one of the bronchovascular elements anatomically and dividing the corresponding fissure with a stapler. In cases of lung cancer, we took samples of the 2/4R, 7, 9R, 10R lymph node stations in resections of the right side and the 5/6, 7, 9L, 10L stations in resections of the left side. Video-assisted thoracoscopic lobectomies were performed with three access ports, one for the optic, another one for traction and an utility incision. The dissection was made through an anterior approach of the pulmonary hilum. In the case of the upper lobes, first we treated the vein, then the artery and at last the bronchus, and then the corresponding fissure was sectioned with a stapler. In the case of mid and lower lobes, we treated the vein, the bronchus and the corresponding artery, in that order, and then the fissure was sectioned with a stapler. The lymph node stations we examined were the same as those in thoracotomies. Postoperative care: both groups of patients were observed at the Critical Care Unit the first 24 hours after surgery; then, if there were not no complications, the patients would be transferred to the General Care Area. In terms of analgesia, we used endovenous drugs the first 48 hours and then we administered analgesics by mouth. Drains were removed when there were no air leaks and when the output was less than 300 ml in 24 hours. We defined –prolonged air leak– as the presence of a leak for more than five days after surgery. Statistics: continuous variables were presented as the arithmetic mean (± standard deviation) or median (interquartile range 25-75), whereas the categorical variables were presented as percentages of the patients. Differences between continuous variables were studied with the Student or Mann-Whitney test according to the distribution that was found. The Chi-Square or Fisher tests were used to compare categorical variables. Differences with p< 0.05 were considered as statistically significant. We used the SPSS software, version 17.0 to carry out the statistical analyses. Out of 153 patients who received a lobectomy, 112 were operated by thoracotomy (73%), and 39 via video-assisted thoracoscopy (27%). Table 1 shows the characteristics of all the patients and the differences between both groups. From the results shown in Table 1, we should focus on the following: the demographic characteristics of both groups, in terms of age, gender and breathing functionality were similar; also the different sites of the lobectomies performed in both groups were equivalent. Patients with stage IA lung cancer were operated by video-assisted thoracoscopy with higher significant frequency (51.3 versus 17.7%; p < 0.001). No differences were observed regarding global postoperative complications, with prolonged air leak being the most common complication in both groups (12.4%) followed by atrial fibrillation (9.2%) and respiratory failure (7.2%). Atrial fibrillation was most frequently observed in the group of video-assisted thoracoscopic lobectomy (6.1 versus 17.9%; p = 0.027). 30-day mortality was 3.3%, with no significant differences between both groups. In patients whose diagnosis demanded lymph node sampling (n = 122), the number of lymph node station samples taken during surgery was statistically higher when the lobectomy had been performed by thoracotomy (4 versus 3.5 examined lymph node stations, p < 0.001). Other statistically significant differences were found in the pleural drainage permanence time and in the length of hospital stay. Patients subjected to video-assisted thoracoscopic lobectomy had a shorter pleural drainage time (4 versus 3 days of pleural drainage, p = 0.004) and shorter length of hospital stay (6 versus 4 days of hospital stay, p = 0.03). Despite the lack of a prospective study validating the superiority of video-assisted thoracoscopic lobectomy in terms of postsurgical results, this approach has gained broad acceptance among thoracic surgeons when performing lung lobectomies. Several studies have shown, retrospectively, that video-assisted thoracoscopic lobectomy at least is not inferior to lobectomy via thoracotomy and has become the treatment of choice for patients with early-stage lung cancer6- 8, 11. In the present series, video-assisted thoracoscopic lobectomies constitute 27% of the total lobar resections performed, similar to the percentage reported in the database of the Society of Thoracic Surgeons (STS) and other series7, 12. However, the use of this technique is very heterogeneously distributed in countries such as the United States, accounting for 40% in some regions and less than 20%12 in others. We do not know of any study reporting the use of this approach by thoracic surgeons, neither in our country nor in Latin America. In this series, video-assisted thoracoscopic lobectomies were performed more frequently in patients with stage IA lung cancer, thus reflecting our preference for this type of lobectomies in patients who come in for a consultation with clinical stage I lung tumor. Nevertheless, we observed a similar amount of patients with clinical stage I tumors that underwent a thoracotomy. This fact shows the surgeons’ preferences regarding some patient in particular or the presence of other conditions indicating surgery via thoracotomy or lobectomies performed at the beginning of the series. At present, we suggest that most patients with stage I lung tumors with indication of lobectomy are offered a video-assisted thoracoscopic surgery. There are many retrospective studies showing that video-assisted thoracoscopic lobectomies are associated with a lower incidence of postoperative complications when compared with the thoracotomy approach5-9. In the work of Subroto et al, about cases reported to the STS database, the authors found a lower amount of postoperative complications in patients who had received a video-assisted thoracoscopic lobectomy in comparison with thoracotomy (26 versus 35%, p< 0.001). Specifically, respiratory and cardiovascular complications (atrial fibrillation requiring treatment) had a lower incidence when the surgery was performed via video-assisted thoracoscopy7. In a similar way, Scott et al found in the secondary analysis of clinical trial Z0030,a lower amount of complications in patients who received surgery by means of video-assisted thoracoscopy (27 versus 48%, p= 0.005)13; also respiratory complications were less frequent. Also in this series, postoperative complications occurred globally in 30.7% of our patients. However, we did not observe a lower amount of postoperative complications in patients operated via video-assisted thoracoscopy. As opposed to other series, we found a significantly higher amount of patients who had received video-assisted thoracoscopy with atrial fibrillation; we do not have an explanation for these findings. We think that if we increase our samples, the incidence of atrial fibrillation should at least be similar in both groups. The most frequent complication was prolonged air leak, which occurred in 12.4% of patients and was a determining factor of the length of hospital stay. This event prevented us from extracting the pleural drainage, thus affecting the postsurgical recovery in at least three ways: 1) the drainage causes pain and limits the movement of the patient and respiratory excursion; 2) the permanence of the pleural drainage can delay hospital discharge, although at present many of these patients are discharged using a Heimlich valve; 3) pleural drainage prolongation increases the risk of empyema. For that reasons, we think that the early removal of pleural drainage shortens recovery times. In our series, just like other authors7, we found that the permanence of pleural drainage was shorter in patients operated via video-assisted thoracoscopy (3 versus 4 days). The length of hospital stay of a patient who received a lobectomy may be prolonged due to the occurrence of complications, the permanence of the pleural drainage or the inability to manage the pain with oral medication. Our median length of hospital stay in patients who underwent a lobectomy was 5 days, similar to that reported in other series. In the group of lobectomies via video-assisted thoracoscopy, the length of hospital stay was significantly lower in comparison with that of the thoracotomy group (4 versus 6 days of postsurgical hospital stay). These findings coincide with the information published in some of the already mentioned series6-9, 11. At present, there is growing interest in moderating health care costs. Hospital care represents one third of health care costs in the United States14 and a prolonged hospital stay has a negative and direct impact on this aspect of the economy. Also, postoperative complications and their severity increase in a direct way the cost of lung surgery15. The work of Swanson et al accounts for lower hospital costs of video-assisted thoracoscopic lobectomy8. While these results have not been confirmed in other studies16, we believe it is an aspect to be taken into account. The lower frequency of complications observed in several studies with video-assisted thoracoscopic lobectomies, plus the shorter length of hospital stay could have a direct impact on hospital cost reduction. Finally, one aspect that was discussed in several opportunities was the oncologic adaptation of video-assisted thoracoscopic lobectomies5, 17. One determining factor of prognosis in patients with lung cancer is the state of mediastinal lymph nodes. One surrogate measure of the correct lymph node staging is postsurgical stage migration in a tumoral disease. Boffa et al17 report a lower migration of stage N0 to N1 when the lobectomy is performed by video-assisted thoracoscopy, but this is not the case with the migration of stage N1 to N2. The implication of these findings is that patients who are actually stage N1 could be considered as N0 and thus receive inadequate treatment. Due to the size of our series we weren’t able to carry out a lymph node migration or survival study, but we observed that patients with indication of lymph node staging who were operated by video-assisted thoracoscopic lobectomy had a lower amount of collected lymph node stations in comparison with the cases of surgery via thoracotomy (4 versus 3.5 collected lymph node stations, p < 0.001). For that reason, we believe we should pay special attention to lymph node staging when the lobectomy is made via video-assisted thoracoscopic lobectomy. We think that the results provided by the video-assisted thoracoscopic lobectomy are similar to those of the lobectomy by means of thoracotomy, in terms of complications and mortality. We suggest paying special attention during lymph node sampling with the video-assisted thoracoscopy approach. The main benefits for our patients, in favor of video-assisted thoracoscopic lobectomy are related to the shorter permanence of pleural drainage and a shorter length of hospital stay. 1. Jacobaeus HC. Über die Möglichkeit, die Zystoskopie bei Untersuchung seröser Höhlungen anzuwenden. Münch Med Wschr. 1910; 57: 2090-2092. 2. McKenna RJ Jr. Lobectomy by video-assisted thoracic surgery with mediastinal node sampling for lung cancer. J Thorac Cardiovasc Surg. 1994; 107: 879-82. 3. Gonzalez Rivas D, Fieira E, Delgado M, et al. Uniportal video-assisted thoracoscopic lobectomy. J Thorac Dis. 2013; 5(Suppl 3): S234-S245. 4. Cao C, Tian D, Wolak K, et al. : Cross-sectional Survey on Lobectomy Approach (X-SOLA). Chest. 2014; 146: 292-298. 5. Rueth N, Andrade R: Is VATS Lobectomy Better: Perioperatively, Biologically and Oncologically? Ann Thorac Surg. 2010; 89: S2107-11. 6. Flores R, Park B, Dycoco J, et al. : Lobectomy by Video-Assisted surgery (VATS) versus thoracotomy for lung cancer. J Thorac Cardiovasc Surg. 2009; 138: 11-16. 7. Subroto P, Altorki N, Sheng S, et al. 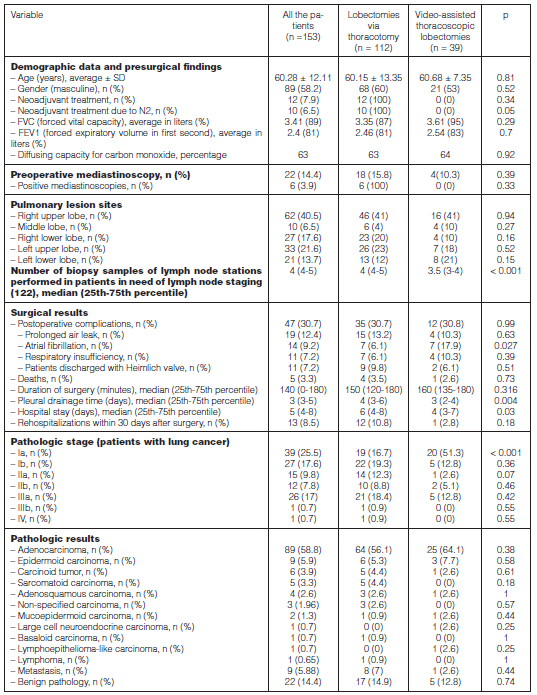 : Thoracoscopic lobectomy is associated with lower morbidity than open lobectomy: A propensity-matched analysis from the STS database. J Thorac Cardiovasc Surg. 2009; 139: 366-78. 8. Swanson S, Meyers B, Gunnarsson C, et al. Video-Assisted Thoracoscopic Lobectomy Is Less Costly and Morbid Than Open Thoracotomy: A Retrospective Multiinstitutional Database Analysis. Ann Thorac Surg. 2012; 93: 1027-32. 9. Nwogu C, D’Cunha J, Pang H, et al. : VATS Lobectomy Has Better Perioperative Outcomes Than Open Lobectomy: CALGB 31001, an Ancillary Analysis of CALGB 140202 (Alliance). Ann Thorac Surg. 2015; 99: 399-405. 10. Defranchi S, Bertolotti A, Blanco G, et al. Lobectomías pulmonar videotoracoscópica y sus resultados inmediatos comparados con lobectomías por toracotomía. Pren Med Argent. 2011; 98: 89-94. 11. Yan TD, Black D, Bannon PG, et al. Systematic review and meta-analysis of randomized and non-randomized trials on safety and efficacy of video-assisted thoracic surgery lobectomy for early-stage non-small-cell lung cancer. J Clin Oncol. 2009; 27: 2553-62. 12. Abdelsattar Z, Allen M, Shen R, et al. Variation in Hospital Adoption Rates of Video-Assisted Thoracoscopic Lobectomy for Lung Cancer and the Effect on outcomes. Ann Thorac Surg. 2017; 103: 454-61. 13. Scott W, Allen M, Darling G, et al. Video-assisted thoracic surgery versus open lobectomy for lung cancer: A secondary analysis of data from the American College of Surgeons Oncology Group Z0030 randomized clinical trial. J Thorac Cardiovasc Surg. 2010; 139: 976-83. 15. Brunelli A, Drosos P, Dinesh P, et al. : The Severity of Complications Is Associated With Postoperative Costs After Lung Resection. Ann Thorac Surg. 2017; 103: 1641-1646. 16. Gopaldas R, Bakaeen F, Dao T, et al. Video-Assisted Thoracoscopic Versus Open Thoracotomy Lobectomy in a Cohort of 13,619 Patients. Ann Thorac Surg. 2010; 89: 1563-1570. 17. Boffa D, Kosinski A, Paul S, et al. Lymph Node Evaluation by Open or Video-Assisted Approaches in 11,500 Anatomic Lung Cancer Resections. Ann Thorac Surg. 2012; 94: 347-353.